welcome to our magical garden on the hill ( Suandoi ) !! If we are lucky enough to have you as our guest you will soon become a part of our Suandoi family. Whether you're looking to have just one or two drinks before hitting Pai town or looking to blackout at the hostel bar you have nothing to fear as we have got you. After a long day enjoying the sights & sounds of Pai by driving around on your moped or doing one of our amazing tours we offer at the hostel you will appreciate returning back home to our wonderful heaven where you can also enjoy our amazing Thai and western dishes at our Suandoi restaurant, food is cheap and seriously tasty. We make sure that you'll feel safe and welcome here. When you've been on the road all day long, seeing sights and all those freakin’ waterfalls, it's cool to have a nice scene at the hostel where you can have some beers, talk and make friends. This will make your stay memorable! Many a traveler stayed quite a bit longer than primarily intended. -Activities we offer slack-line, badminton, Yoga Matt, Live music, etc. -Relaxing area as we are calling a Tree House with sunset view, tons of hammocks and seating area next to the pond. ** We do not provide mosquitoes net and padlock for the locker. ** Arrival Time is very important, your booking will be cancelled if you do not arrive on time, with any issue please let us know. 4 bed basic dorms (very basic) include: Hot shower, Air-conditioning, lockers, towel, single wooden bed, located in the wooden house downstairs. 5 bed basic dorms include: Hot shower, Air-conditioning, lockers, towel, single bed, reading light, power socket, located in the wooden house upstairs. 6 and 8 bed basic dorms include : Hot shower, Air-conditioning, lockers, towel, bunk-bed, located in the wooden house downstairs. 12 bed deluxe dorms include: Reading light, personal power socket, locker, Hot shower, Air-conditioning, fans, towel, bunk-bed. Private Building. NOTE : Air-Conditioning for every dorm work certainly hours. Dorm Room is located in the teak wooden house. 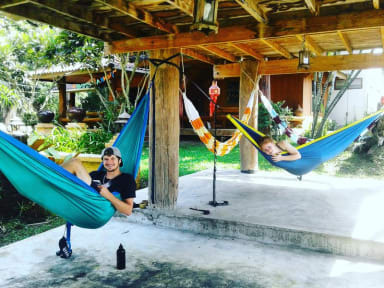 The Suandoi Backpacker resort is the perfect place to stay in Pai if you want to relax and if you want to be surrounded by nice and chilled people. I really enjoyed my stay here and can just recommend to stay here. Amazing place, feel like in the middle of the jungle. Many pillows around to relax, always good music at the bar. Quiet, but still 10m walking only from center. And attracts very nice people, I came for 2 nights but ended up for almost 2 weeks. Negative (deluxe?) dorm: put a thin foam on the mattress as you can feel the springs in your body, especially on top beds where you have to crawl on your knees. Also would be good to have lights above mirrors and not behind you, this is so asian..
Had a great stay at Suandoi! It’s the perfect place to just relax and live the pai lifestyle for a while. A 10 minute walk to town, but there’s food and drinks here so it’s nice to just hang out, walk the slack line, and sit in a hammock all day. Great place! Very beautiful! The staff is amazing. Only negative was a lot of ants in our room. Loved our stay here. Free yoga in the mornings (although this doesn't run all the time) and loads of nice outdoor space and hammocks to relax. Cool and cheap bar too, which even when shut played relaxing music throughout the day, giving the place a lovely atmosphere. Room was very spacious and had a great view and good AC. Also offers free pick up and drop off into town. I LOVED this place. The atmosphere was amazing, the place itself was so tranquil and funky, and the staff were so friendly. Would definitely recommend. Suandoi’s was a great spot to stay! The layout and all the chill spaces are lovely. I visited during the low season so there weren’t many people to socialize with. Though the staff created a good environment. It is a bit of a walk into town if you’re not comfortable on a scooter. But that didn’t bother me. The room was clean, aside from some ants in the sink and bathroom - which mind their own business if you leave them alone - I felt very comfortable.